“I cried in Auschwitz. 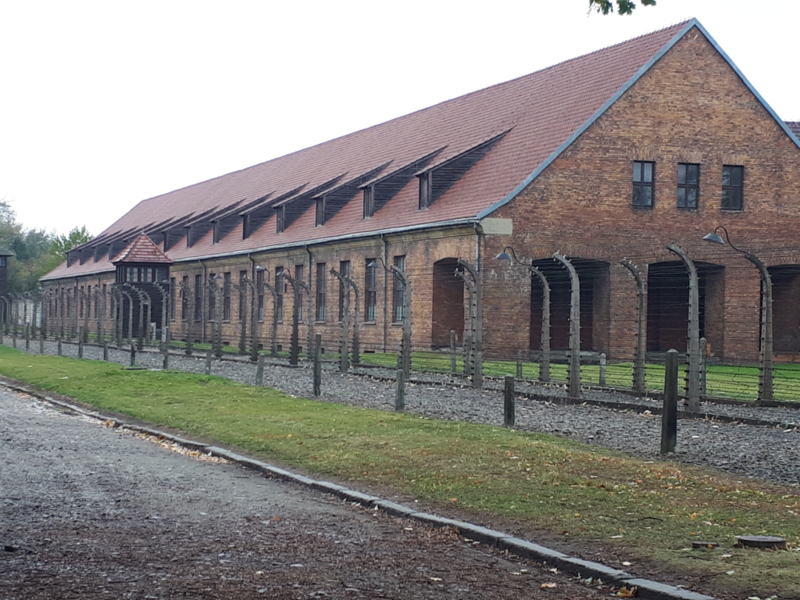 Whilst we are taught about the devastating tragedies that happened in this monumental place, the tone and atmosphere is truly something that can only be experienced by physically being there.” Anonymous Year 10 student. “Seeing the children’s clothes was really emotional.” Hollie Year 11. The following day students descended over 150 metres underground to explore the Wieliczka Salt Mines, created in the 13th century. This was a firm favourite of the group, seeing the impressive beauty of the pure salt made into huge chapels and chandeliers so far underground. “The salt mine was interesting because of the beautiful effects in the mine and how everything was made out of salt.” Anonymous Year 10 student. 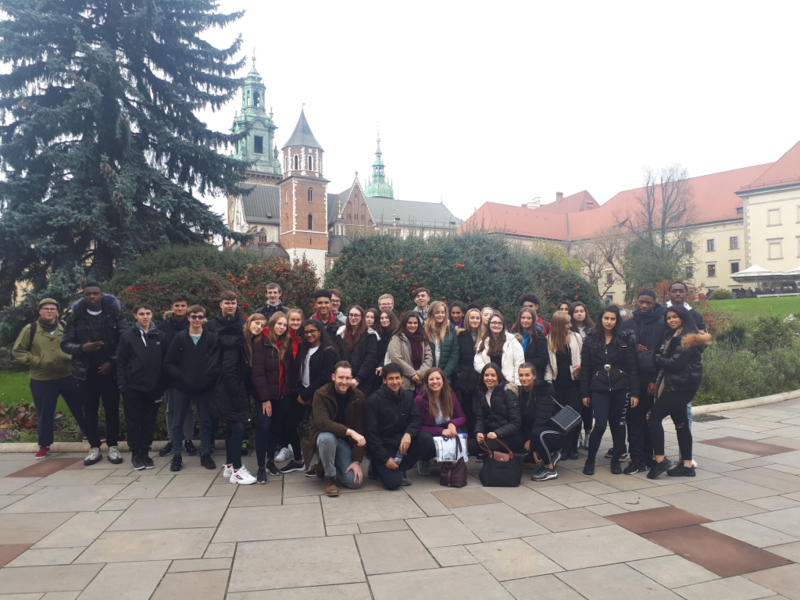 Students also took a walking tour of Kraków seeing the main points of interest such as the Royal Apartments in the Wawel Castle, the Jagiellonian University (one of the oldest in the world), St Mary’s Church and the medieval Cloth Hall. After a fascinating few days in Kraków, we took an overnight coach (all dressed in pyjamas!) to Berlin, arriving at 5.45am! Despite their tiredness, the students persevered to enjoy one of the best days of the trip! The group started at Brandenburg Gate in Berlin and took a guided tour of the city. The guide was excellent and the students were very engaged and asked many insightful questions. 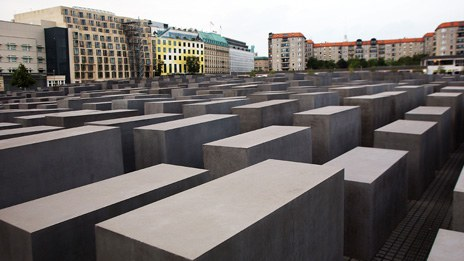 The tour included sites such as the Berlin Wall and the Berlin Cathedral, as well as the memorial to the murdered Jews of Europe. Later that day, students visited the DDR Museum. This is devoted to showing what life was like under Communist rule in East Berlin during the Cold War. Students were intrigued by the interactive experiences here, such as trying to locate an electronic bugging device, watching TV shows from the era and seeing themselves in clothes from the time in East Berlin. 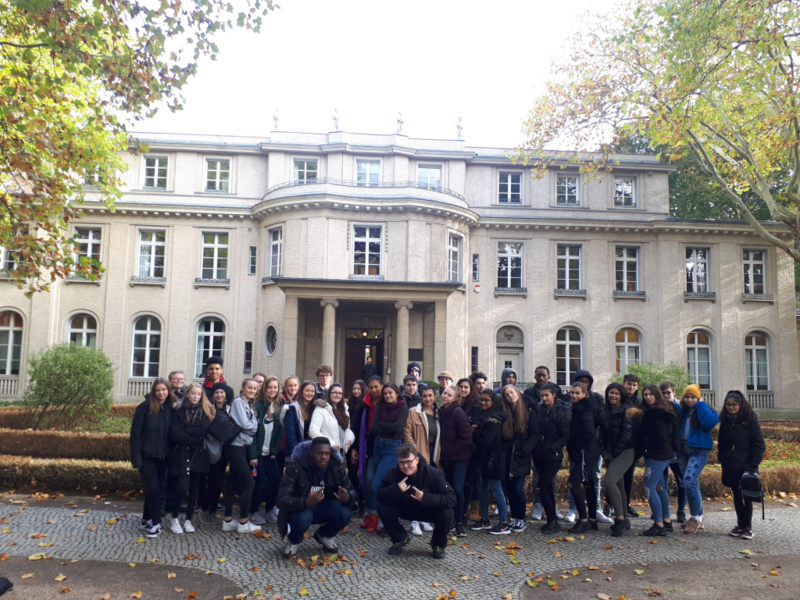 On the fifth day, students visited the House of the Wannsee Conference. This is a beautiful villa in a really picturesque setting. The setting is starkly juxtaposed with the shocking event that took place there in 1942. Several leading Nazis met to discuss the ‘Final Solution to the Jewish Question’. The process initiated here culminated in the death camps and the extermination of more than 6 million Jews. Here, students could actually read the transcripts of their conversations, as well as view the exhibition of historical sources showing the progression of anti-Semitism in Germany over time. This was an invaluable revision resource for the History GCSE Germany course. We also saw fantastic views of Berlin from the famous TV tower (365 metres high) which is the tallest building in Europe. Students could even point out the sites they had seen on the walking tour the previous day, from the tower. That evening, were were lucky enough to visit the Reichstag (German Parliament) and saw once again stunning views of Berlin – this time by night – from the dome of the Reichstag. 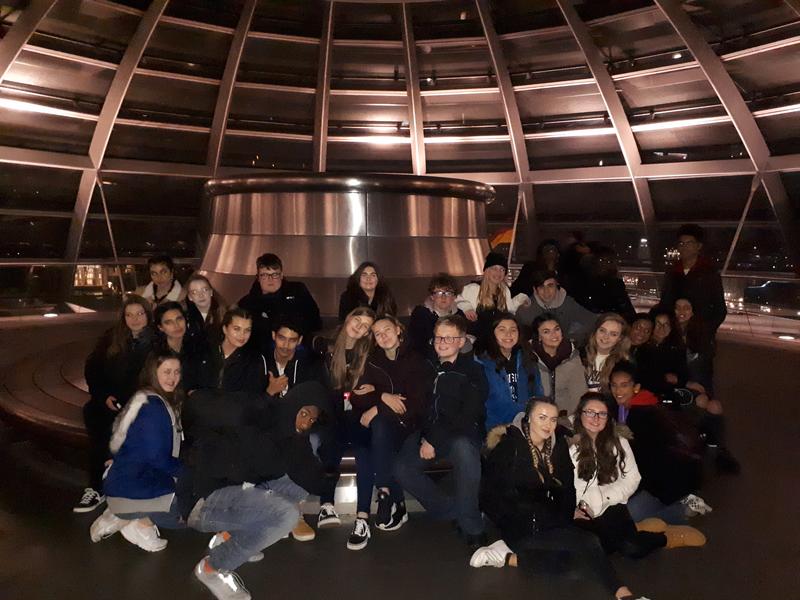 Students learnt all about the history of the Reichstag and the involvement with the Nazis and Hitler. We could also see right into the actual chamber where the current German parliament debate, prompting one student to say it was: “impressive as it suggests there is transparency and no secrets from the German people”. On the final day, we went to the Topography of Terror- an exhibition dedicated to the use of terror in many European countries by the Nazis through groups such as the SS and the Gestapo. Myles (Year 10) was particularly pleased to learn about the impact on Serbia, as he has relations from the country. 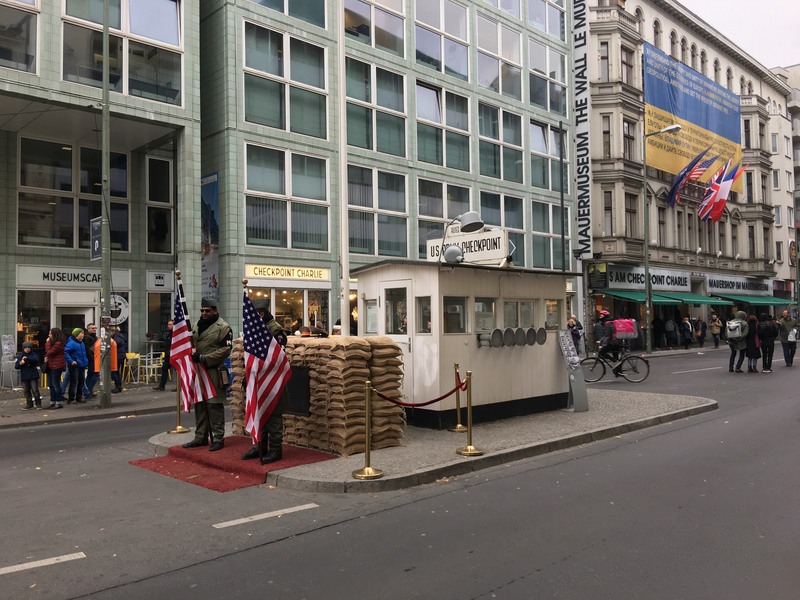 Our final stop was Checkpoint Charlie – one of the few ways people could cross the Berlin Wall during the Cold War (if they had permission!) We visited the accompanying museum telling the amazing stories of those who found ways of escaping the oppressive regime in East Berlin, such as digging tunnels, flying man-made aircraft and hidden compartments in car bonnets. The students were very shocked and amused by some of the ingenious ways people came up with to flee to West Berlin. This was incredibly useful for their study of the Cold War at both GCSE and A Level. The students’ behaviour overall was excellent and their engagement and inquisitiveness was fantastic! Despite there being a mixture of students from three different year groups, the students transcended any barriers of age and there was a real feeling of camaraderie in the group. It was great to see them all getting on together so well. This culminated in a furious mass table football match between the teachers and students. The teachers were victorious – but it was close! When asked about their favourite aspects of the trip, the majority of students mentioned making new friends and getting to know people who they wouldn’t have had the chance to otherwise. It was a very successful trip and both staff and students thoroughly enjoyed it. It has also given the students expansive knowledge to help them with their GCSE and A Level topics. We hope to make this a regular trip so many other students can also benefit from the experiences we had, with it next running in October 2020.